Hoot, hoot, who's there? 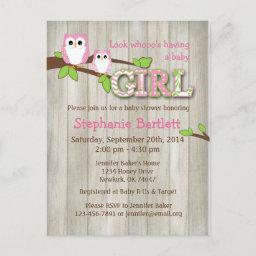 These adorable owl invitations give you the chance to celebrate the arrival of the newest member of your family with these cute baby shower designs. 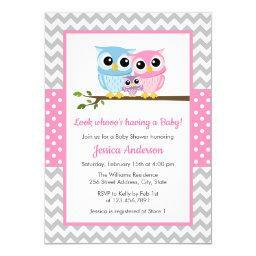 Owl baby shower invitations are a great way to welcome your guests for a very special celebration. Customize the template with the honoree's name and the shower details to give these lovely invites that special touch. All of the standard designs you find on this page give you the chance to shape them to your specification giving you an amazing opportunity to get a one of a kind that's guaranteed to be a hoot! When you choose an owl invitation for the baby shower theme you are leaving yourself open to a wind range options. 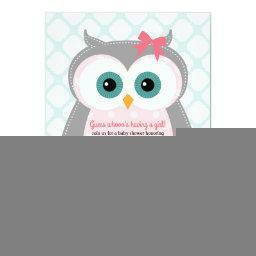 These cute owl designs compliment the theme of a baby shower perfectly. While stork might bring the baby, the owl will be there waiting when it arrives. 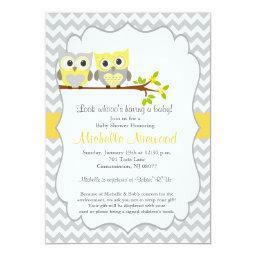 Throw a baby shower that embraces the wisdom and regal nature of the owl with the fitting invitations for your afternoon of fun. Would you like to save on your invitation order? Then you will be thrilled to learn that the standard invitations can save you as much as 40% when you make use of the bulk discount rate. Still, it doesn't matter if you are planning to host a small party (25+ guests) or a large baby shower (100+ guests) you can save 15-40% on your cards. These savings apply to the standard invitations you will find on the site. 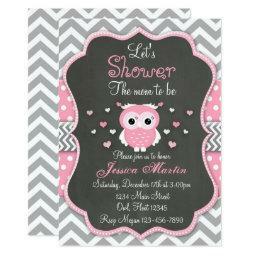 Now you can get the cute owl invitations for your shower at incredible prices. Are you on the lookout for a real hoot of a good time? 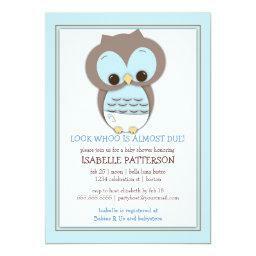 Then you will definitely enjoy the idea of sending out one of these lovely owl baby shower invitations. Owls have made an appearance in our lives since childhood, filling the pages of beloved nursery rhymes as well as animated entertainment. Even into adulthood the wise old owl is one of the most recognized and respected member of the animal kingdom. 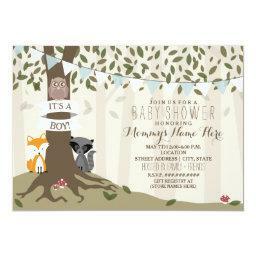 And that is why they are some of the most popular choices when they decide woodland baby shower invitations are the perfect fit for their party. Owls aren't alone. The woodland themed shower is one of the most popular styles of celebration today. And it has so much to offer. There are plenty of other animals that offer a similar base to shape a familiar and friendly baby shower. 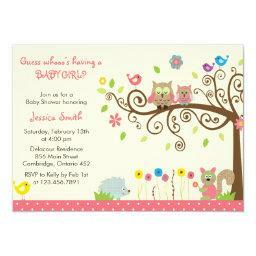 One of the most common companions of the owl can be found in these fox baby shower invitations. 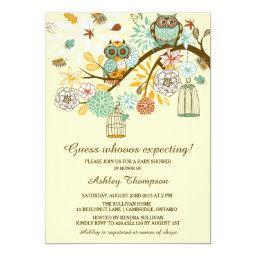 These owl invitations make use of a lovely pastel palette that brings the woodland theme to life. 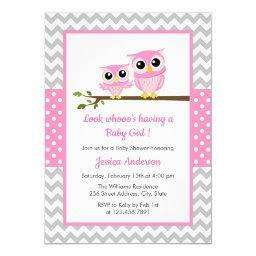 By softer colors the designs take on a children's book quality that underlines the baby shower perfectly.